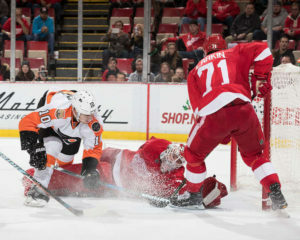 The Detroit Red Wings’ struggles at Joe Louis Arena in the home-heavy month of December continued on Sunday night. Jimmy Howard was stellar again, as he stopped all 35 shots he faced from the Philadelphia Flyers. The Flyers came into the night riding an eight-game winning streak, which has propelled them to a second-place tie with the Pittsburgh Penguins in the Metropolitan Division. Philly has the league-lead in goals-for and goals-against, which few would have expected this game’s result to remain scoreless after three periods. No Flyers game had fewer than three combined goals scored this season. Philly goalie Anthony Stolarz, playing in only his second NHL game, pitched a 28-save shutout in this goalie duel. Both goalies were spectacular on the night. In the third period, Red Wings fourth-line forward Steve Ott was the victim of a blindside hit by Michael Raffl, which led to defenseman Xavier Ouellet stepping in to defend him. It was a decisive victory by the young French blueliner, and it energized his team and the crowd as a result. Eventually Flyers forward Brayden Schenn would win it for his team 2:44 into overtime as he stretched forward to reach around the glove of a sprawling Howard. Detroit had 28 shots, but 16 attempts were blocked and 9 missed the net. Blashill knows his team has to produce offense if they want to win games. Howard’s amazing .945 save-percentage through 14 games cannot be relied upon every game. Surprisingly, the Wings’ 70 goals were greater than the totals of Ottawa (69) and Boston (69), both of whom are in playoff positions on Sunday. He also realizes that many of his players prioritize playmaking above shooting, which leads to some missed opportunities. He also noted the lack of net presence as a reason why goals are sparse. Ouellet echoed the need for net presence. Not only are the Red Wings failing to earn points, but their Atlantic Division-mates are also struggling. Aside from division-leading Montreal, Ottawa (34 points), Boston (32), Tampa Bay (30), Florida (30), Toronto (27), and Buffalo (26) all have low point totals. Only eight points separate the last-place Sabres from the second-place Senators. Only the Habs have a positive goal differential. The Metropolitan has five teams with greater goals for than goals against. This current situation is ideal for Detroit, as the struggles continue for their rivals, a playoff spot may be claimed for fewer total points in this group. Detroit is now 6-7-3 overall at home (7-5-1 on the road), 2-4-1 in November, and 0-3 in December as of December 11th. Beginning on the 19th, 11 of 12 games will take place on the road. Entering this stretch with a sub-par home record leaves the team in a vulnerable position, making it necessary for them to win a majority of those games just to stay competitive. This week there are home games on Tuesday (vs. Arizona), Thursday (vs. Los Angeles), and Saturday (vs. Anaheim). These should be considered must-win games for the Wings.